When was the VC instituted? The Victoria Cross was instituted by a Royal Warrant dated 29 January 1856, but was made retrospective to the autumn of 1854 to cover the period of the Crimean War. Prince Albert, the Prince Consort was much involved in the decision to institute the Victoria Cross - but the popular idea that the Prince designed the Cross is not supported in any of the surviving documents. It is thought that the manufacturers were responsible for the design. However, it was Queen Victoria who chose the inscription on the obverse. Hancocks (Jewellers) Ltd, London, have made all the Victoria Crosses since the inception of the award. What is the VC made of? All VCs are made from bronze. The metal comes from melted down breeches of guns captured from the Russians at Sebastopol in the Crimea. The rough cast Crosses are then individually hand finished; each is therefore unique. The remaining ingot of bronze, believed to be sufficient for a further 80 Crosses, is held by the Ministry of Defence. What colour is the ribbon of the VC? The original Warrant gave the ribbon colour as red for the Army and blue for the Navy. With the formation of the Royal Air Force on 1 April 1918, the use of the blue ribbon was abolished. Living holders of 'Naval' VCs were required to exchange their blue ribbons for red ones. The colour of the ribbon might more accurately described as 'wine red'. What is the inscription on the obverse? The recipient's name, rank, number and unit are inscribed on the reverse of the suspension bar. The date of the act of bravery is inscribed in the centre of the reverse of the cross. Who was the first recipient of the Victoria Cross? Mate C D Lucas, Royal Navy, HMS Hecla, Baltic, 21 June 1854, Crimean War. 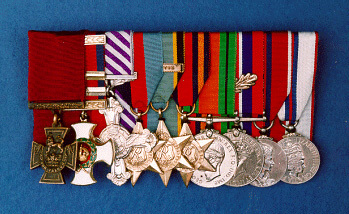 Lucas's VC was therefore the first one awarded to the Royal Navy. Who was the first Army VC? Sergeant L O'Connor, 23rd Regiment (later Royal Welch Fusiliers), Battle of Alma, 20 September 1854, Crimean War. Who was the first Air VC? 2nd Lieutenant W B Rhodes-Moorhouse, Special Reserve, 2 Squadron, Royal Flying Corps, France, 26 April 1915, First World War. Which sailor, soldier and airman was the first to be awarded the VC during the First World War? In each case the date of the action is given, not the date of Gazette. Sailor Commander H P Ritchie RN, Dar-es-Salaam, East Africa, 28 November 1914. Soldier Lieutenant M J Dease and Private S F Godley, 4th Bn, Royal Fusiliers (City of London Regiment), Mons, Belgium, 23 August 1914. Airman 2nd Lieutenant W B Rhodes-Moorhouse, (see First Air VC above). Which sailor, soldier and airman was the first to be awarded the VC during the Second World War? Sailor Lieutenant Commander G B Roope RN, HMS Glowworm, North Sea, 8 April 1940. Soldier 2nd Lieutenant R W Annand, Durham Light Infantry, France 15/16 May 1940. Airmen Flying Officer D E Garland and Sergeant T Gray, 12 Squadron, Royal Air Force, Maastricht Bridges, Belgium, 12 May 1940.
Who were the first Commonwealth VCs? CANADA - Sergeant A H L Richardson, Lord Strathcona's Horse, 5 July 1900, South African War. AUSTRALIA - Captain N R Howse, New South Wales Army Medical Corps, 24 July 1900, South African War. NEW ZEALAND - Major C Heaphy, Auckland Militia, 11 February 1864, New Zealand (Maori Wars). INDIA - Sepoy Khudadad Khan, 129th Duke of Connaught's Own Baluchis, Indian Army, Hollebeke, Belgium, 31 October 1914. SOUTH AFRICA - Corporal F C Schiess, Natal Native Contingent, Zulu War (Rorke's Drift) 22 January 1879.
Who is the most recent VC? Who was the youngest VC recipient? Hospital Apprentice A Fitzgibbon, Indian Medical Establishment, Taku Forts, China 21 August 1860. Age: 15 years 3 months. Who was the oldest VC recipient? Lieutenant W Raynor, Bengal Veteran Establishment, Indian Mutiny, 11 May 1857. Age: 69 years. Has anybody been awarded the VC twice? Lieutenant A Martin-Leake, Royal Army Medical Corps. First award as a Surgeon-Captain, South African Constabulary, South African War, 8 February 1902. Second award, Zonnebeke, Belgium, 29 October and 8 November 1914. Captain N G Chavasse MC MB, Royal Army Medical Corps. First award, Guillemont, France, 9 August 1916. Second award, Wieltje, Belgium, 31 July and 2 August 1917. Captain C H Upham, New Zealand Military Forces. First award as a 2nd Lieutenant, Crete, 22-30 May 1941. Second award, Western Desert, 14 July 1942. What is the largest number of VCs awarded on a single day? Twenty-four were awarded for the second relief of Lucknow, 16 November 1857. (This figure includes 5 VCs awarded under Clause 13 of the 1856 warrant during the period 14-22 November 1857). Can the VC be awarded by ballot? What is the total number of VCs awarded? To date, the total is 1355. This figure includes three 'Bars' (second awards) and one 'ungazetted' award made to the American Unknown Warrior on 28 October 1921. How many VCs have been awarded since 1946? Which British Army units have received twenty or more VCs? * The Royal Engineers claim 55 VC winners. Where a recipient was serving, on attachment to another unit at the time of winning the VC, or subsequently transferred to another unit, the award will sometimes be 'claimed' by both the recipient's original unit and also by the one to which he was attached or transferred. For this reason, no list of this type should be regarded as definitive. Are there any instances of the VC being awarded to father and son? Father - Lieutenant F S (later Field Marshal Earl) Roberts, Bengal Horse Artillery, Indian Mutiny, 2 January 1858. Son - Lieutenant The Hon F H S Roberts, King's Royal Rifle Corps, South African War, 15 December 1899. Father - Captain W N Congreve, Rifle Brigade, South African War, 15 December 1899. Son - Brevet Major W La T Congreve DSO MC, Rifle Brigade, France 6-20 July 1916. Father - Major C J S Gough, 5 Bengal European Cavalry, Indian Mutiny, 15 August 1857, 18 August 1857, 27 January 1858 and 23 February 1858. Son - Captain and Brevet Major J E Gough, Rifle Brigade, Somaliland, 22 April 1903. Have any brothers been awarded the VC? Major C J S Gough, 5 Bengal European Cavalry, Indian Mutiny 15 August 1857, 18 August 1857, 27 January 1858 and 23 February 1858. Lieutenant H H Gough, 1 Bengal European Light Cavalry, Indian Mutiny, 12 November 1857 and 25 February 1858. Captain R W Sartorious CMG, 6 Bengal Cavalry, Ashanti War, 17 January 1874. Captain E H Sartorious, 59 Regiment, Afghan War, 24 October 1879. 2nd Lieutenant A B Turner, Royal Berkshire Regiment, Vermelles, France, 28 September 1915. Major (temporary Lieutenant Colonel) V B Turner, Rifle Brigade, Western Desert, 27 October 1942. Lieutenant (temporary Lieutenant Colonel) R B Bradford MC, Durham Light Infantry, Eaucourt l'Abbaye, France, 1 October 1916. Lieutenant Commander G N Bradford RN, HMS Iris II, Zeebrugge, Belgium, 22-23 April 1918. Have members of the same family ever been awarded the VC and the GC? Can the VC be awarded to a woman? Women are eligible for the VC but to date, no award has been made. Is there an annuity paid to recipients of the VC? Provision for the payment of an annuity of £10 to non-commissioned recipients was contained in the original warrant. From 1959 living holders of the VC were granted a tax-free annuity of £100 regardless of rank. The figure remained at £100 until 15 August 1995 when it was raised to £1300. Have any VC's been forfeited? Under the terms of the original Warrant there was an expulsion clause that allowed for a recipient's name to be erased from the official Register in certain wholly discreditable circumstances. HM King George V had expressed his strong disapproval of the practice of forfeiture, however the amending Warrant of 1920 still contained the relevant clause. A later amending Warrant published in 1931 gave the Sovereign the new power to annul any forfeiture and restore both the award and pension. Although there are eight instances of forfeiture, the names of these men continue to be included in both official and unofficial lists of recipients. Mounted soldiers. Originally horses would carry the soldiers into battle, but later armour or tanks would perform the same function.